ISD got its start in WWII – when the country was preparing soldiers for war. 400 + films – taught standards. Observations in classes to see that standards were met. 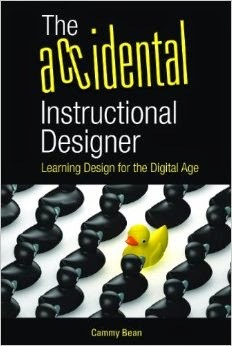 Instructional design is all abut theory. Cognitivism – what’s going on inside. Motivation. The mind and belly stuff. Do they GET IT? Think alouds, scenarios, checklists. Connectivism – from know-how to know-where. Find it yourself through networks and community. Downes, Siemens. Personal knowledge management. “Adult Learning Theory” – she doesn’t believe in it. Good learning theory is good learning theory. Difference is that kids want to talk about dinosaurs. Connectivism & ARCS: US Navy’s Project MMOWGLI – thousands of players participate to work with pirate attacks off of Somalia. This is a gnarly problem. Don’t know what the protocol or policy is – not teaching to objectives – but we’re trying to figure it out. They can see it is all about them their tasks, their priorities. The WIIFM. The experience is vivid and authentic – full of worked examples, with opps to think about and DO something. “So that’s how it works” – with commentary and progressive building checklists that explains how it works. Success and stretch. (If it’s all success, then it feels like a waste of time). The ID brings order to chaos. Make choices to extend lessons, information, etc. Don’t let the learner just flop about. just serving up a tasty buffet isn’t enough. Greatness emerges from positive deviance! Find the lesson or message you want them to know. Have a really clear way – not a spreadsheet! – where we clearly communicate what greatness will look like. Then have classes, simulation. etc. Great ID for CPR Training? (www.articulate.com showcase example). You find a person and you have 3 minutes to save the person. “You are walking down the street when a man falls to the ground…” The conditions are real. It’s scary. You don’t need stuff until you need it – performance support “Adult CPR app” – American Heart Association app. Will you have it in the moment of stress? Great ID touches minds and hearts. Assure that employees experience some success as they grow. Build in success. Don’t start with a test that brings them to their knees. Not good for confidence. Use two side arguments. Approaches that admit multiple views are more convincing than one-sided litany. Assume they are smart. People learn better from controversy. Prepare them for the barriers you discovered when you did the analysis. Share the issues to come and the workarounds. Encourage reflection. Provide some structure. Use role modeling and conversations. Use stories – show emotions and reactions. Engage people in examination of examples. Touch minds and hearts with stories that ring TRUE. Deliver smarts – shifting it closer to where it’s needed. Tomorrow: organization knowledge, community, social networks, performance support, choice! Giving learners choices – is too much freedom too much? Sometimes the learner doesn’t know enough to make a good choice. Need good scaffolding. The ID picks the right spots for choices. Help the learner make a good choice – structure. Don’t want to give them so much freedom that they fail or lose confidence. I like pie. And apparently, I like elearning pie. Ellen Wagner came up with the slices – I’m enjoying riffing on it. Welcome to conference proposal season! I am thrilled and honored to be this year’s TK12 planning committee chair, following in the noble footsteps of the wonderful Ellen Wagner. Although the conference may feel like it’s years away, proposals are now being accepted! We’re looking for great case studies, tales of organizational change using elearning, practical sessions and workshops for those new to elearning, sneak peeks at upcoming technology, and ideas for improving your practice as a trainer using technology within an organization. Come join the fun and submit your session ideas by June 13. Last week I had the pleasure of presenting a session at the ASTD Learning 2.0 Conference in Westford, Massachusetts. Focused on ONE topic – social learning. One-day only event – easy in and out – and not a huge time commitment. Close to home. Did I mention it was about 5 minutes from my house? I got to go to a conference AND tuck my kids in that night. Great speakers! The lineup include Tony Bingham, David Wilkins, Jim Storer, Jean Marrapodi, David Kelly and Gina Rosenthal. (I blogged a couple of the sessions: my notes from Tony Bingham’s keynote and Jim Storer on the Emerging Role of Community Managers). I presented a 90 minute Sight Seeing Tour of Social Media – basically a view of SoMe through my own experience. I’ve posted my slides below, but most of the session was conversation and chatting as the group shared their experiences, concerns and questions. As someone who’s been living and breathing Social Media for awhile now, it was great to step back and see what a wide world it really is and how wide the spectrum of usage actually is.